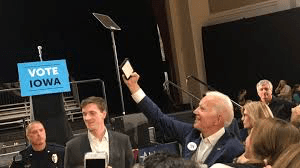 Joe Biden still hasn’t declared and he continues to lead the 2020 Presidential Democratic field…. A new poll shows former Vice President Joe Biden with a commanding lead over the field of Democratic contenders in the first-in-the-nation caucus state of Iowa. The survey from Monmouth University finds Biden with 27-percent support, followed by Vermont Sen. Bernie Sanders (I) at 16 percent. No other candidate pulls double-digit support, but South Bend, Ind., Mayor Pete Buttigieg continues his impressive rise in the polls with a third-place showing at 9-percent support. Rounding out the field are Sens. Elizabeth Warren (D-Mass) and Kamala Harris (D-Calif.) at 7 percent, former Rep. Beto O’Rourke (D-Texas) at 6 percent, Sen. Amy Klobuchar (D-Minn.) at 4 percent and Sen. Cory Booker(D-N.J.) at 3 percent. The survey finds Biden mopping up among older people and working-class voters. Biden has 44 percent support from those over the age of 65. He has 38 percent support from those earning less than $50,000 and 34 percent support among those without a college degree. “If Biden does get into this race, he’ll start out as a clear front-runner in Iowa,” said Patrick Murray, the director of the Monmouth University Polling Institute. “Not only does he garner support from crucial demographic groups but he is almost universally well-liked among all Democratic voters.”…..